I love South Asian culture. I love it. I can’t get enough of the food (Saag Paneer? Chicken Korma Masala? Naan? Yes please). My favorite type of dancing (besides hip hop) is bhangra and I typically have no less than 10 bhangra songs on my iPod at any given time. If it wasn’t completely weird for a white girl to do it, I’d wear a sari to pretty much everything (it’s impossible not to feel extremely feminine and beautiful while wearing one…not so much for the salwar kameez, oddly enough). And lest you think I’m a South Asian fetishist, let me clarify by pointing out that I grew up in Queens, NY, where diverse cultures bump into each other on a constant basis. This either makes you want to entrench yourself more deeply into your own culture, or to dive into the waves of immigration that bring you new and interesting ways to see the world. Besides food, clothing and music, my appreciation for South Asian culture has extended to a veritable bear hug of eyebrow threading, or epilation if you want to get technical. 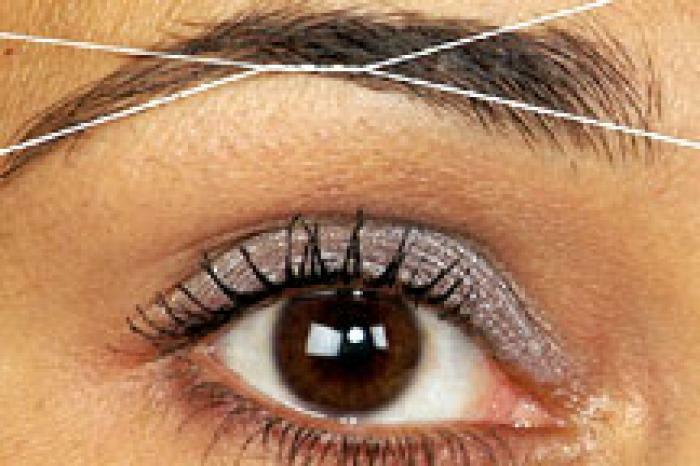 I started threading seven years ago, after I messed my eyebrows up through tweezing. The lovely ladies at Unique Threading on 23rd Street and 6th Avenue nursed my brows back to health and I became hooked and haven’t tweezed or waxed since. Threading sounds just like what it is. Thread is looped around a row of hairs and pulled out. Threading allows for greater precision than waxing (i.e. better shapes), but fewer ingrown hairs than tweezing. Also, with waxing, over time the skin that is being pulled can become discolored, which does not occur with threading. If it’s done well, threading can be completely painless, but even if it’s not, it still only feels like a minor scraping, vs. a ripping sensation that you get with waxing. Anyway, at the risk of sounding like the tired New Yorker who exclaims that everything is soooo much better there, than here in DC, I really struggled with finding a good threader when I moved to the District. I had built up a two-year relationship with Sweety, my threader in New York. Not only did she consistently make my eyebrows look amazing (I would get stopped on the street by women with brows askew, asking me where I got mine done), she and I became friends. I knew how difficult it had been to find her and so I was prepared for a long slog to find my “Sweety” in DC. I started at the threading booth at Union Station,(50 Massachussetts Ave NE, upstairs on the right) which is close to where I live. Not only was it in walking distance (which is what I had been used to in New York), it cost $10, only $1 more than what I was used to paying. I went a few times. No matter how much I asked them to maintain the shape and length, they gave me what seemed to be standard-issue brows. During a trip back to New York (and a strategic visit to Sweety), I was roundly chastised for letting them ruin her work. Back to the drawing board. A few of my Desi friends had suggested Threads on U Street (1534 U St NW, 202-265-7710). At $15, it was more expensive than what I was used to paying, but I gave it a try, since I was in the area visiting friends. The woman who threaded me did a great job. I have no complaints. If I lived closer, I’d probably make that my threading place. Since I was pretty satisfied with Threads on U, I thought I’d try Threads in Chinatown (515 H St NW, between 5th and 6th Streets, 202-289-7710), since that was within decent walking distance from my house. My threader did an adequate job, but one brow was thinner than the other and it was hard to justify the $15. If I had a bigger threading budget, I’d probably give it a few more tries, but there was still one more place that I had to try. I went to Dupont Threading yesterday (1314 18th Street, NW, 202-293-1748). It had come highly recommended and at $12, it seemed reasonable. Granted, it wasn’t within walking distance, but I’m in Dupont a lot, so it wasn’t totally out of the way either. You have the option of making an appointment, but walk-ins are also welcome. I waited about 10 minutes (sometimes I’d wait 20 for Sweety–she liked to give her favorite clients a face massage after threading) for my turn. As I started to tell the tale of woe that has become my eyebrow threading journey, my threader stopped me and said “I understand. Let’s clean them up and then decide what to do from there.” Once she did that, she was able to come up with a plan to grow out that pesky left brow. So friends, I’m writing this with my perfectly shaped eyebrows and happy to report that Dupont Threading gets my bachelorette rose. Written by Juliet Vedral. Check out her media empire at The Wheelhouse Review. I like that they have videos outside Threads on U Street. Hopefully they are not live!